The Saigon Lacquer Tray Small has a sleek finish with 16 varnish layers. 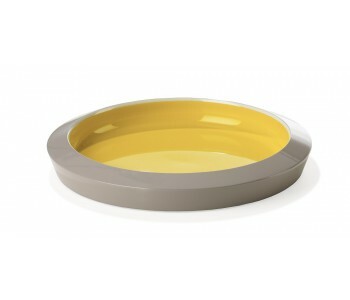 The extraordinary color combination Sulphur with yellow accentuates the shape of the serving tray. There is also a larger version Saigon Lacquer serving tray in the color combination Sedonia Sage with Grey. The Saigon Lacquer serving tray has a wood base and is varnished in 16 layers. This gives the tray a sleek and glossy finish. The Saigon Lacquer trays are varnished in different color combinations. Every combination strengthens the shape of the serving tray. The Saigon Lacquer Serving Trays are available in this Small size in the color combination Sulphur with Yellow and a Medium Size serving tray in Sedonia Sage with grey.